Added on October 5, 2012 by PS Cat02. Hi everybody. Bunny and I were scheduled to go to Austria for 10 days to attend a big political-art/artistic-politics program at the Steirischer herbst festival in Graz. However, Bunny's health has been so bad lately that she became too weak to travel and had to stay home. I went by myself, which was a very lonely feeling, especially when I was riding the airplane and when it was time to eat. And when I got to Graz I kind of had a hard time focusing on the programming because I was worrying a lot about Bunny. But I did manage to meet a lot of wonderful people and was exposed to an enormous amount of new ideas attending the 24-hour-a-day talks, workshops, and meetings. It was very intense and I didn't get to sleep much but I feel like I learned a lot in a very short amount of time. When I got back Bunny asked me to tell her, in excruciating detail, every little thing that I could remember from the whole trip. So I did that. Like this thing. I think this was the first meal I ate in Graz. 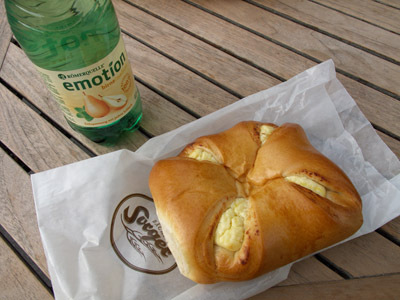 I got it at a nice bakery on Jacominiplatz. It has fluffy cream cheese in it. The tea was flavored with pear and mint, which might not sound so good, but it turned out to be a really nice combination. This area had a lot of small cafes and imbiss stands so I ate here quite a few times. I like street food. Speaking of take-away food, I noticed a lot of people eating Chinese food out of a paper-box while walking down the street. Bunny and I saw the same thing in Berlin but that time we didn't have a chance to eat any of it. I like Chinese food and I think it's always interesting to eat it in different countries, to see how it changes to become "local food". This time I got to eat "nudelbox mit gemüse" at 2am in the morning - I think that just means noodles in a box with vegetables. It actually tasted a lot like ordinary chow mien, but more salty because they poured a sauce over it. This is me sitting in front of the venue, were I gave our Pinky Show presentation. A lot of people came and I think they liked the presentation because they did a lot of clapping and whoop-whoop stuff when it was over, which was really nice. Of course I also met with local area cats, which also went well. We met behind the Opera Hall, which is just down the street. The tall thing in the photo is 'The Bloghouse' - a temporary tower built out of scaffolding and discarded windows - inside Radio Helsinki broadcasted a radio show for the duration of the event, and on the upper levels growing things as an act of biological disobedience. Here's me having technical difficulties before the start of my lecture. I took a photo of this statue of four birds talking to each other for Bunny. This statue is by the Schloßberg - an extremely interesting area with lots of very old buildings & structures. Here I'm standing right next to the birds-statue, pointing my camera up towards the famous Graz clock tower. I wanted to walk up the old, winding stone stairs and visit the clock tower but I had just eaten a piece of apple strudel so I was too full. Graz has some of the most beautiful old doors I have ever seen. I wish I could go back just to take photos of doors! This one is on a church built around 1696. This is a small sculpture of a cat-in-a-shoe that I saw in the window of an antique shop. Don't I kind of look like this cat? Anyway, Graz has a lot of antique shops which are really fun to visit, but I kind of feel bad because I never buy anything. I arrived at the airport at 3:30am in the morning for my 6am flight out of Graz - way too early! So I sat in this giant toy airplane until it was time to go. This is a very large pretzel I bought to eat at the airport in Frankfurt. It was so chewy that by the time I finished eating it two hours later my face was really tired. But I enjoyed it. So that's the last photo I have from the trip. My big hope is that Bunny will start feeling stronger so that we can do these trips together again. Finally, I wanted to extend our gratitude to Florian Malzacher, co-curator of the project, for inviting us to participate and giving us this great learning opportunity, and of course to make new friends and alliances. Everything at Steirischer herbst seemed to run near-perfect, even though this was easily the most complex program we have ever been a part of. The responsible team should be acknowledged! : Theresa Adamski, Markus Boxler, Christine Conrad-Eybesfeld, Lisa Dreier, Katrin Ecker-Eckhofen, Hannah Ertl, Anne Faucheret, Philipp Forthuber, Lina Maria Gärtner, Kerstin Geder, Roland Gfrerer, Adina Hasler, Anja Herman, Cornelia Iber, Dominik Jutz, Veronica Kaup-Hasler, Kira Kirsch, Matti Kruse, Martin Ladinig, Florian Malzacher, Karl Masten, Christiane Mörth, Maria Motter, Arno Muchwitsch, Heide Oberegger, Vesna Pajičić, Sithara Pathirana, Kirsten Patent, Andreas R. Peternell, Petra Pölzl, Danica Radat, Angelika Raffer, Johanna Rainer, Sabine Reisner, Anthony Saxton, Hermann Schapek, Maria Schneeweiß, Susanne Spörker, Annika Strassmair, Gerda Strobl, Christian Sundl, Artemis Vakianis, and Florian Wimmer. Thank you to everyone at steirischer herbst from the bottom of our hearts! That's all for now, though I promise to write again soon. Bunny and I send our love.